← Our Founders: How Did They Do It? 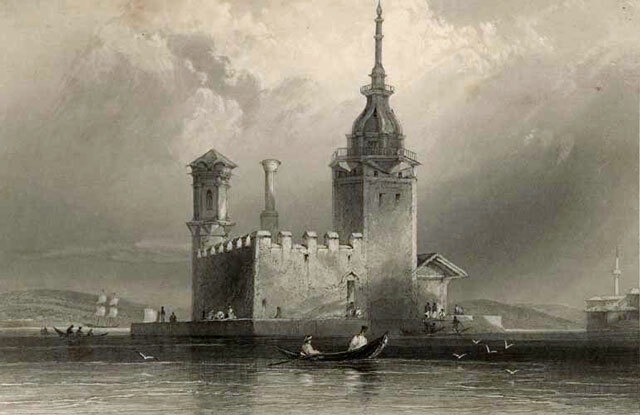 Maiden Tower, artist's concept, on the Bosporus, Turkey. Once upon a time, An overbearing father grounded his daughter Hero, a ripening young melon; he exiled her to a maiden’s tower on the edge of the water. But, that didn’t stop the willful virgin from seducing Leander, a gorgeous hunk of a boy who lived across the water in another part of Turkey. Leander took the bait; when he saw the light, he hit the water running. The clueless, dripping wet Leander raised his fist to the tower door: “Knock, Knock.” Hero, quivering with anticipation, she was ready for him; she opened her door dressed only in her birthday suit, and Leander, indeed, was surprised—it showed. The Elizabethan poet Marlowe tells the story this way (well, almost) in rhyme and meter, but his poem stops when the lovers meet. Marlowe never finished his poem Hero and Leander, but many other poets have taken up the torch, so to speak, and they have written verses to complete the tragic story. In the ancient myth of Hero and Leander, Leander nightly swims the Hellespont and, guided by the light from Hero’s tower. All goes well for the pair until one stormy night when the torch gets extinguished, and without the beacon to guide him, Leander gets lost and drowns. The story doesn’t end there, because the dead Leander washes ashore below the tower. Hero looks down from her tower and sees his body below her. Overcome by grief; she throws herself from the tower. The young lovers are united in death. Seized her, and such an impotence to stay. That from the turret, like a stricken dove. With fluttering arms she leaped, and joined her drowned love. Leigh Hunt (1819) lines 286–293. The myth of Hero and Leander, ill-fated lovers divided by the sea, is older than written history. The myth was already well known in the time of the Roman poet Ovid, who wrote about them in Heroides (Heroines). In 1993, this story was told again in prose by the Slavic author Milorad Pavic in his strange and absurd novel The Inner Side of the Wind, or the Novel of Hero and Leander. Pavic’s novel, set in modern Serbia, tells of two lovers separated by “the waves of time”: Leander lived at the turn of the eighteenth century and Hero lived in the twentieth century. “All futures have one great virtue: they never look the way you imagine them,” said the father to Leander. Prophetic words, Leander would become literate, avoid the many Turkish sabreurs who chased him, but he cannot avoid his tragic fate. Leander: I’ve been dead for three days now. And You? My congratulations to translator Pribicevic-Zoric who must have found her work challenging. I recommend this book to those readers who enjoy a well-told story with a good number of absurd situations and no really satisfactory ending. Day 65: The Inner Side of the Wind, or The Novel of Hero and Leander, Milorad Pavic, Christina Pribicevic-Zoric (Translator) (1993). This entry was posted in Classics, Fiction, Poetry, Translation and tagged postaweek2011. Bookmark the permalink. I regret to say that Turks appeared in this part of the world much later (1453 aC). This area it’s called the Asia Minor, not Turkey. Mia Culpa; Thanks for the correction. I erred when I wrote: “Leander lived at the turn of the eighteenth century and Hero lived in the twentieth century.” Clearly Leander lived in an earlier epoch–in the story he avoids the lead cavalry of the Turks to meet his mythic death centuries later in the Hellespont.